HOUSING MINISTER SIMON COVENEY has said he will be forced to introduce regulations for Airbnb if a memorandum of understanding cannot be reached with the company. Coveney met with Airbnb bosses recently to discuss the role the company plays in Ireland’s rental market. He wants to curtail property owners choosing to rent to guests for short stays rather than to long-term tenants. The number of hosts in Dublin has shot up in the past number of years – with a 100% rise in just a year. A total of 6,100 hosts let out part or all of their properties at some point for guests in 2016, compared to 2,960 hosts between October 2014 and September 2015. 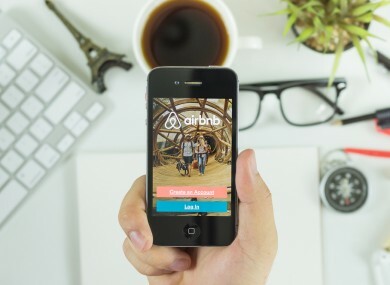 People using the Airbnb service to host guests in their homes in Dublin collectively earned €52 million last year, according to a new report commissioned by the company. Recently, a number of major cities around the world have clamped down on the use of Airbnb. Hosts in Berlin are only permitted to rent out their property for 50% of the year, while Amsterdam imposed a limit of 60 nights per year. Is Ireland likely to go down the same road? “Well, lets wait and see what the discussion with Airbnb results in,” the minister told TheJournal.ie yesterday. I would be hopeful we would be able to put in some memorandum of understanding that can make it very clear that those who want to use Airbnb need to do so responsibly. “We don’t want to be facilitating the use of the Airbnb platform on a commercial basis, in a way that undermines the rental market,” said Coveney. If we get a satisfactory arrangement in place with them, and I think we can, then I don’t think I will need to legislate or to introduce regulations. If we can’t do that, then obviously I will be forced to do that. Last year, such use of short-term lettings hit the headlines when An Bord Pleanála upheld a Dublin City Council (DCC) ruling that an apartment owner in Temple Bar needed to apply for planning permission if they wanted to continue to rent the property out via Airbnb. The apartment on Crown Alley in the middle of Dublin’s busiest tourist area reportedly made €79,000 in one year from renting out to visitors, rather than one long-term tenant. Following the ruling, Coveney vowed to tackle the issue of landlords renting out their properties through Airbnb. The minister issued guidelines to local authorities with a specific focus on those in urban areas where the housing and rental crisis is most acute. Following his meeting with the website’s bosses, he said the government and Airbnb committed to work together to ensure that people are not using the platform for commercial use without having the proper planning permission in place. The minister told TheJournal.ie that many people use the lettings platform on a short-term basis for a number of weeks or months in a year. However, he said that to purchase properties to let them out on the AirBnb site – using them almost as B&B or hostel-style accommodation – is not right. That, in my view, is not the spirit of what should be happening through that platform and I think they [Airbnb] agree with that and we are going to look to try and end that. He said those who use the website and have tenants on a rolling basis are required to apply for a “change of use in planning permission” for the home. He added that AirBnb is a very positive thing for many homeowners and visitors to this country. The minister added that he does not want to see owners bypassing tenancy arrangements by using the Airbnb platform as a commercial business. Email “Coveney says he will regulate Airbnb if 'satisfactory arrangement' not reached over renting”. Feedback on “Coveney says he will regulate Airbnb if 'satisfactory arrangement' not reached over renting”.